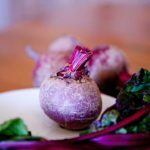 Reserve any nice smaller beet leaves, halve any larger beets and cook, covered, in a pan of boiling salted water for 15 to 20 minutes or till tender. Meanwhile, squeeze the juice of 1 clementine into a large bowl with 1 tablespoon of extra virgin olive oil and a good splash of red wine vinegar. Peel the remaining 3 clementines, slice into fine rounds and arrange on your 4 plates. Drain the beets and briefly refresh in cold water until cool enough to quickly rub off the skins. Halve or slice a few, then toss them all in the dressing. Taste, season to perfection with sea salt and black pepper, then pick the tarragon and toss with the reserved beet leaves. Divide between your plates, crumble over the goat’s cheese and walnuts and drizzle lightly with extra virgin olive oil.